A mattress is one purchase that you cannot rush. The wrong mattress can leave you tossing and turning, unable to stay comfortable and sleep through the night. The right mattress can get you to that dreamy comfort zone where you get a full night’s sleep and wake up feeling rested and refreshed. Comparing and trying out several different brands and models to find the right mattress in West Jordan is the key to getting that amazing, restful sleep every night. 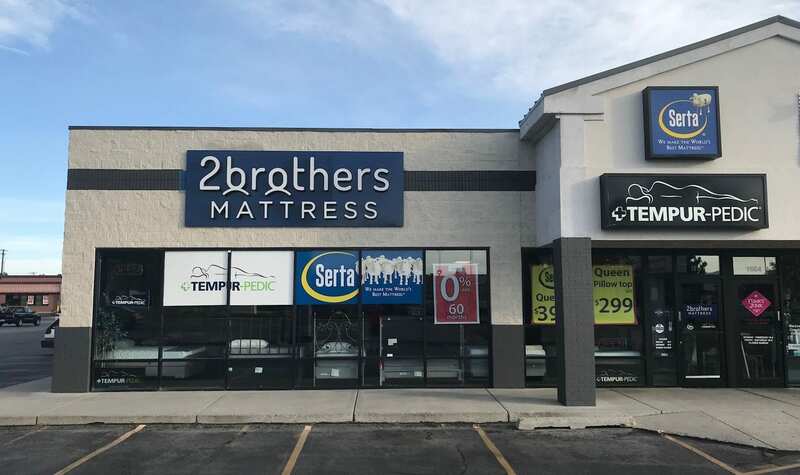 There are dozens of places you could shop for a mattress in West Jordan, South Jordan Sandy area, but when you don’t have a lot of extra time to spend traveling around town, come to 2 Brothers Mattress. Our wide selection of several leading mattress brands, combined with competitive pricing, will help you stay on budget and still get the mattress you have always dreamed about. The process of choosing from all the mattresses out there can seem overwhelming and confusing. That’s where our friendly West Jordan sales experts can help. At 2 Brothers Mattress, we are more than just a store that sells beds. We are experts in helping you compare the benefits of each set so you can find the one that fits your sleep style. We are conveniently located in Provo, within a few minutes drive of most locations in southern Salt Lake County. Our stores are conveniently open on weeknights and Saturdays to help accommodate your busy schedule and get you in and out, and into your new bed today.